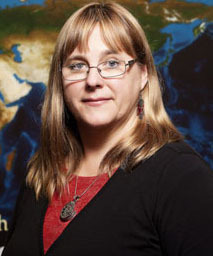 Professor D. Jean Hutchinson is the Department Head for Geological Sciences and Geological Engineering, is a registered Professional Engineer in Ontario, and is a Fellow of the Engineering Institute of Canada. A Geological Engineer by training, Jean practiced as an engineer for several years, first with the Ontario Ministry of Transportation, and later with Klohn Crippen Consultants, before joining first the University of Waterloo and then moving to Queen’s University. Jean specializes in rock engineering, site characterisation and risk management for mining and transportation infrastructure, with a focus on landslide hazards. Kalenchuk, K.S., Hutchinson, D.J., Diederichs, M.S., and Moore, D. 2012. Downie Slide, British Columbia, Canada. Landslides: Types, Mechanisms and Modeling, (eds. J.J. Clague and D. Stead), Cambridge University Press: 345-358. Hoek, E., Hutchinson, D.J., Kalenchuk, K.S. and Diederichs, M. 2009. Influence of in situ stresses on open pit design, Appendix 3 in Guidelines for Open Pit Design, (eds. J. Read & P.F. Stacey). CSIRO Publishing, Melbourne: 437 - 445. Kalenchuk, K., Diederichs, M., Hutchinson, J. 2012. Geomechanical interpretation of Downie Slide considering field data and three-dimensional numerical modelling. Landslides. LASL-253R3, accepted 1 Oct 2012. Quinn, P.E., Diederichs, M.S., Rowe, R.K., Hutchinson, D.J. 2012. Development of Progressive Failure in Sensitive Clay Slopes.Can. Geot. J., 49 (7), 782-795. Kalenchuk, K.S., Diederichs, M.S., Hutchinson, D.J. 2011. Three-dimensional numerical simulations of the Downie Slide to test the influence of shear surface geometry and heterogeneous shear zone stiffness. Computational Geosciences, 16(1), 21-38. Lato, M., Diederichs M.S., Hutchinson, D.J., Harrap, R. 2012. Evaluating roadside rockmasses for rockfall hazards from LiDAR data: Optimizing data collection and processing protocols. Natural Hazards, 60, 831–864. Quinn, P.E., Hutchinson, D.J., Diederichs, M.S., Rowe, K. 2011. Characteristics of large landslides in sensitive clay in relation to hazard and risk. Can. Geot. J., 48(8), 1212-1232. Quinn, P.E., Diederichs, M.S., Rowe, K., Hutchinson, D.J. 2011. A new model for large landslides in sensitive clay using a fracture mechanics approach. Can. Geot. J., 48(8) 1151-1162. Winner of the 2012 R.M. Quigley Award, Canadian Geotechnical Society. Lato, M., Diederichs, M., Hutchinson, D.J. 2010. Bias correction for Lidar scanning of rock outcrops for structural characterization. Rock Mechanics & Rock Eng., 43(5), 615-628. Quinn, P.E., Hutchinson, D.J., Diederichs, M.S., Rowe, K. 2010.Regional scale landslide susceptibility mapping using the weights of evidence method: An example applied to linear infrastructure. Can. Geot. J., 47(8), 905-927. Lato, M., Hutchinson, D.J., Diederichs, M.S. 2010. Geomechanical feature extraction and analysis using LiDAR data: IOC Mine.CIM Bulletin, Dec 2009 / January, 4(8), Paper 12. Kalenchuk, K., Hutchinson, D.J., Diederichs, M.S. 2009. Application of spatial prediction techniques to defining three-dimensional landslide shear surface geometry. Landslides, 6(4), 321- 333. Lato, M., Hutchinson, D.J., Diederichs, M.S., Ball, D., Harrap, R. 2009. Engineering monitoring of rockfall hazards along transportation corridors: Using mobile terrestrial LiDAR. Nat. Hazards Earth Syst. Sci., 9, 935–946. Lato, M., Diederichs, M.S., Hutchinson, D.J., Harrap, R. 2008. Optimization of LiDAR scanning and processing for automated structural evaluation of discontinuities in rockmasses. Int. J. Rock Mech. & Min. Sci., 46(1), 194-199. Lato, M., and Hutchinson, D.J. 2008. Mining for LiDAR data. (Cover feature article). Professional Surveyor Magazine. February. Hutchinson, D.J., Diederichs, M.S., Pehme, P., Sawyer, P., Robinson, P., Puxley, A., Robichaud, H. 2008. Geomechanics stability assessment of World War I military excavations at the Canadian National Vimy Memorial Site, France. Int. J. Rock Mech. & Min. Sci., 45, 59-77. Nasseri-Moghaddam, A., Cascante, G., Phillips, C., Hutchinson, J. 2006. Effects of underground cavities on Rayleigh waves – Field and numerical experiments. Soil Dynamics and Earthquake Engineering, 27(4), 300-313. Hutchinson, D.J., Diederichs, M.S., Carranza-Torres, C., Sheriff, C., Kjelland, N., Harrap, R. 2006. Landslide hazard management: Using geotechnical monitoring, virtual process models and decision support technology. Felsbau: Rock and Soil Engineering, 24 (3), 24-29. Majid, A., Khan, A.H., Cascante, G., Hutchinson, J., Pezeshkpour, P. 2006. Characterization of cemented sand with the pulse-velocity method. Can. Geot. J., 43(3), 294-309. Conference papers are available upon request.